laborer of the eleventh hour: Want to turn water into wine? Want to turn water into wine? Yes, the good ol' miracle that we've heard of that seems so beyond us and our abilities. As recorded by the Gospel according to St John, this was the first miracle performed by Jesus Christ. A small summary of the story - Jesus was at a wedding in Galilee and they had run out of wine. His mother, St Mary, kinda put Him on the spot to do something about it. He had people bring jars of water, He turned it into wine, and the people loved it - asking "Why didn't you bring out this good stuff before?!" According to the customs, the 'good' wine was always brought out first so people can be impressed with the wine. Then, when people had a little too much to drink, the host would replace it with 'bad' wine because the guests were already getting a little buzz, so they wouldn't be able to tell the difference. There was something about this 'transformed' wine that was like no other they've tasted before. Now, I have a question for you. When was the last time YOU had that impact on someone? As an Orthodox Christian, we believe in the sacraments to allow us a more complete, clear, and true understanding of the Fullness of Christ. In each of the 7 sacraments, or mysteries, something cool happens. There is a divine power from God that 'transforms' something. In the celebration of the Eucharist, bread and wine become Body and Blood, in a wedding the 'two become one flesh', etc. There is a transformation. Fr Alexander Schmemann, in his book Liturgy and Life, emphasizes the fact that we should integrate 'Liturgy' (symbolizing all the sacraments) and Life. That we should live a Sacramental Life to live to our fullest potential, that Christ has designed for us. So, we understood that in a sacrament, there is a transformation going on. Mother Teresa understood this, and said "Let no one ever come to you without leaving better or happier. Be the living expression of God's kindness"
When is the last time your life transformed somebody's? 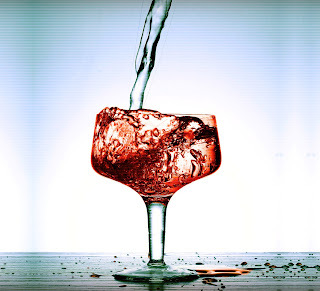 When is the last time YOU turned water into wine? I love this! Never thought of the sacraments that way.